Many Mission Critical applications are implemented on HP OpenVMS computer systems. COMTEK /VMS is designed to monitor those important OpenVMS Systems, and alert the Network Management system if an error is detected or threshold is crossed. COMTEK /VMS monitors Applications, Hardware, and OpenVMS. COMTEK can be used on Itanium, VAX and Alpha systems - from Blades to Large Scale machines. COMTEK/ VMS provides monitoring and management information to any standard Network Manager such as HP OpenView, Tivoli, Sitescope, Solarwinds, and others. Users can use this data for capacity planning purposes. COMTEK has the ability to monitor Mission Critical Processes, and alert the Network Manager instantly if one has failed. This allows time to remedy the issue before it develops into an even larger problem. Often a process can be fixed before users are impacted. Another important capability is monitoring Application Logs. COMTEK can filter these logs, and send important messages to the Network Manager as alerts. The data that is gathered and maintained by COMTEK /VMS is represented in a set of Management Information Base (MIB) specifications. The COMTEK MIB for OpenVMS contains information about system resources, CPU and disk utilization, process statistics, critical processes, and queue statistics, as well as hardware errors. Thresholds can be set to determine the level at which an alert will be generated. COMTEK /VMS was designed to be extremely powerful and at the same time have almost no impact on server performance. It has a very small operational footprint, is non-proprietary, and dependable. COMTEK is monitoring OpenVMS servers for many enterprises worldwide. COMTEK /VMS has been in use since 1996 (then called NMServer). COMTEK monitoring solutions have been available on other platforms since 1998. Installing COMTEK /VMS is simple and safe. Complete installation instructions may be found in the COMTEK /VMS Installation Guide. COMTEK is compatible with HP TCP/IP Services, MultiNet, and TCPware. The Download Package available on the Web Site is complete. There are no additional components to purchase. The Download contains the complete User Guide, Sample Configurations, Installation Aids, Sample Programs, Installation Guide, Readme, and other install tools. What is the COMTEK MIB? The MIB for COMTEK /VMS is custom made for OpenVMS, not adapted from some other operating system. Below is an overview of the data available in the MIBs. The NM*SysMgr component of COMTEK /VMS keeps tabs on CPU utilization, disks, processes, queues, systems errors, and others. The NM*VmsMon component provides SNMP access to VMS MONITOR-like operating system performance data. What alerts does COMTEK /VMS provide? As a proactive system management tool, COMTEK /VMS provides a large number of trap types. Traps are issued by COMTEK when system conditions exceed thresholds that you have set. The table below summarizes the available traps. NM*SysMgr generates the system management traps. Additionally, the NM*TrpMgr component of COMTEK /VMS allows you to send your own text messages as traps to your Network Manager. I want to send OPCOM messages to my Network Manager, can I do that with COMTEK /VMS? Yes. 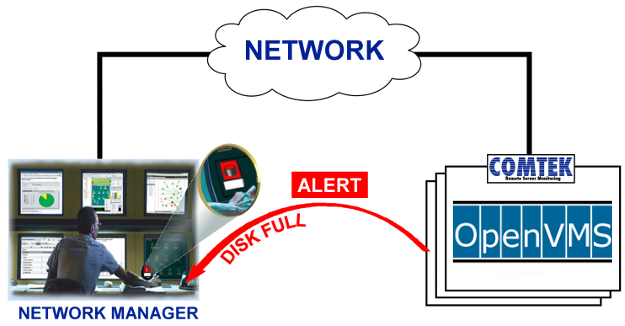 COMTEK /VMS turns VMS Opcom messages into ALERTS. You may specify which classes of Opcom messages you wish to handle. What are the components that make up COMTEK /VMS for and how do they interrelate? Will COMTEK /VMS for work with my TCP/IP stack? COMTEK /VMS is compatible with UCX, TCP/IP Services, MultiNet and TCPware. In fact, if you are already using the SNMP agent that comes with your TCP/IP stack, COMTEK /VMS can be configured to run alongside of that agent. How would I use COMTEK /VMS? SNMP Network Management is composed of two major pieces - an Agent (such as COMTEK /VMS) running in each element that you wish to monitor and a Manager (such as NetView or OpenView). Your organization may be using a Network Manager to monitor its local or wide area network presently. If so, COMTEK /VMS would allow this same Manager to monitor and manage your OpenVMS systems. Similarly, if you are implementing a new network management system, you may wish to include your local or remote VMS systems. COMTEK /VMS includes a Remote Console subagent which can be used to send DCL commands from the Network Manager to the NMServer agent. The agent processes the DCL command and returns any results to the manager. This feature may be easily disabled when there are concerns about security. What is included with COMTEK /VMS for OpenVMS? COMTEK /VMS is a complete package - it includes the COMTEK Agent, MIBs, HP OpenView NNM Integration Tools, Installation Aids, Documentation and Support. Also included are sample integration tools for HP OpenView and HP Systems Insight Manager.